We recently did a Gale’s Root Beer Review. This brew is made by Chef Gale Gand, and features Cinnamon, Ginger, and Vanilla. Like most root beers, Gale’s Root Beer comes in a dark brown bottle. The bottle’s label is white with a lot of text going on. It is ugly. We poured Gale’s into a frosted mug to do the root beer review. It produced a decent head. It has a low-to-medium amount of carbonation. The smell is good, with an immediate scent of cinnamon, which is interesting to say the very least. It isn’t what I would consider a typical root beer smell. One reviewer said it smells like cloves, another…dirty socks! The first mouthful of Gale’s Root Beer goes in smooth, but with a lingering aftertaste of the cinnamon and ginger. The flavor that is left in your mouth is akin to a Christmas gingerbread or gingersnaps, though it isn’t really strong. The flavor is somewhat weak and disappointing. We gave the Gale’s Root Beer a review score of 2.5 out of 5. Gale’s Root Beer Ingredients: Carbonated water, cane sugar, caramel color, natural and artificial flavoring, cinnamon, ginger, vanilla extract, phosphoric acid, potassium sorbate, sodium benzoate added as preservatives. Gale’s Root Beer is distributed by Gale’s Bread and Butter, Inc. Riverwoods, IL. 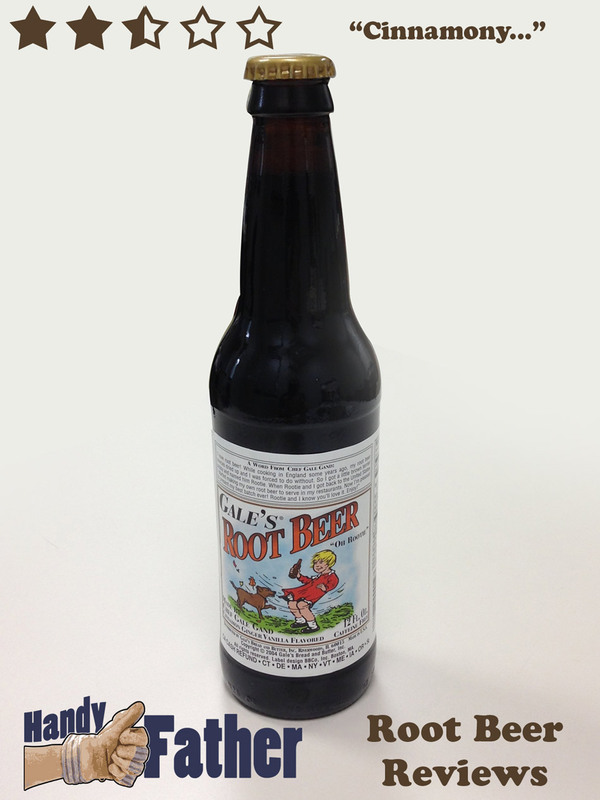 If you like obscure root beers, give Gales ROOT BEER MADE BY CHEF GALE GAND – “Visit Gale’s Bread & Butter!”, 12-Ounce Glass Bottle (Pack of 12) a try. It is different, and that isn’t always a bad thing.